The first of the Oracle Think Tank support in “Dragon King’s Awakening”. 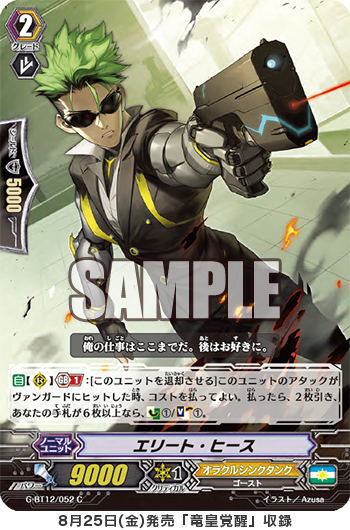 AUTO [RC] Generation Break 1: [Retire this unit] When this unit’s attack hits a vanguard, you may pay the cost. If you do, draw two cards, if you have six or more cards in hand, Counter Charge 1/Soul Charge 1. The “Lauris” SP Clan Pack contains many powerful luxurious SP Foil Cards for 【Harmony】, all centered around “Wonderful Voice, Lauris”! And the “Raindear” SP Clan Pack contains many of the Drive Check connected support card related to the abilities of “Song of Gracious, Raindear”, all in luxurious SP foil! Because these are all such powerful cards, if you can get the,, you should add them to your Deck! And “Elite Heath” from “Dragon King’s Awakening”, when its attack hits a Vanguard, it can retire itself to draw 2 cards, and if there’s 6 or more cards in your hand, you get to Counter Charge 1 and Soul Charge 1, making it a Unit that recovers the costs! A single copy of this card supports the 【Oracle】 ability of 《Oracle Think Tank》 that depends on you having 5 or more cards in your hand. It increases your hand, lets you recover the cost and presses a ton of pressure on the opponent! From here on, for “Today’s Card”, we’ll be introducing cards from the 5th Clan Booster “Prismatic Divas” and the 12th Booster “Dragon King’s Awakening”! Please enjoy!